The lakes region has much to enjoy, picturesque views, boating, hiking, quaint lakeside towns, and more. You will fly into Milan, where you may want to spend a night or two. Enjoy time shopping in Milan before heading to to the most famous of the lakes region, Lago di Como or Lake Como. Upon landing at Malpensa international airport or from your hotel in Milano the easiest way to get to Lake Como is by private transfer . We suggest that you stay in the center lake area which is also where the famous town of Bellagio is located. Upon arrival, drop your bags and stroll to Villa Melzi. The magnificent gardens are a short walk from the center of Bellagio. Depending on your level of energy, there are several other villas you may want to visit. Villa Serebelloni, Villa Monastero and Villa Carlotta boast impressive gardens, and perfectly manicured gardens. Not to miss on Lake Como is a trip to Villa Balbianello, now part of Italy’s FAI National Trust. During your private visit inside this stunning villa, you learn the property was once owned by Guido Monzino, where he planned his expeditions to the North Pole and Mt. Everest. After 3 days in Como, you have several options for your next stop. 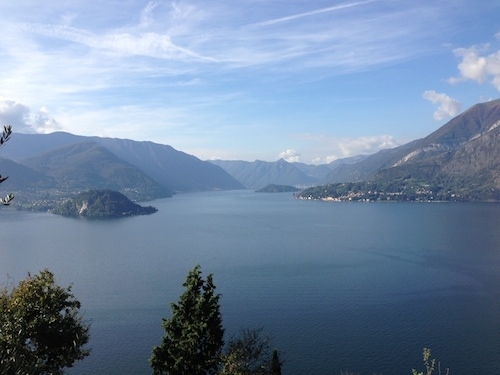 For a fall trip, we suggest 3 days in Lake Como, 3 in Lake Maggiore and Lake Orta, and 4 in Piemonte. Lake Maggiore and Lake Orta, although lesser known than Como, and offer their own set of delights for visitors. On Lake Maggiore, enjoy the Borromeo Islands, a group of 3 islands with pristine gardens and gorgeous architecture. Enjoy a trip back in time on Isola dei Pescatori, or Fisherman’s Island, filled with ancient fisherman’s homes and classic wooden boats. This is a perfect stop for lunch, with locally caught seafood served in a casual setting. Then take the public boat to Isola Bella, and enjoy an interior visit of Palazzo Borromeo, whose richly furnished rooms and marvelous gardens make this fairy tale like palazzo a must see. The theatrical terraced garden is filled thousands of plants and statues silhouetted on marble balustrades. For fellow foodies, enjoy a visit to the aging cellar of Guffanti cheeses near Stresa on Lake Maggiore. If you are interested in purchasing gifts, we can arrange a trip to the Alessi factory store of cutting edge table top serving pieces, while history buffs may opt for a trip to the Val Strona to see the indigenous Walzer culture or for a hike. On Lake Orta, one can take a private boat ride to Isola San Giulio, a small island in the middle of the lake. Alternatively, spend a few hours enjoying the Basilica di San Giulio, then walk uphill to see Sacro Monte. This impressive Roman Catholic devotional complex of twenty pavilions containing life size standing figures is located on the summit of the hill San Nicolao and has been included on the UNESCO World Heritage list. Fall is a wonderful time to travel to Italy, with fewer crowds, and is a perfect time to visit the Piemonte region. A favorite among gastronomy lovers, starting in October, visitors can enjoy fresh local truffles. The Piemonte region also has some of the best wine in all of Italy, including Barbaresco, Barolo, and Barbera. Outside of the fall months, we suggest a slightly different itinerary: 3 days in Lake Como, 4 in Lake Garda and Verona, and 2-3 in Venice. Located in the Veneto region straddling the Adige River, Verona is the second largest city in the region. As many may well know, the city is famous for being the setting of Shakespeare’s Romeo and Juliet. The city boasts other popular tourist attractions, including annual art fairs, museums, galleries and the impressive Arena di Verona, a 1st century amphitheater that still hosts live performances. Finish your trip with a few days in Venice, only an hour’s train ride from Verona. As always, we will pre purchase your train tickets and arrange private transfers when needed. As you can see, the lakes region has much to offer, for the nature lover, foodie, religious minded, or history buff. Don’t wait, contact the Italian Concierge to start planning your trip today!